Today is a very important day. No, not because I received some Ranalisma rostrata in the mail, but because if a bill currently in hearings in Congress is passed, I won't be able to buy plants from fellow hobbyists, or even keep them at all. 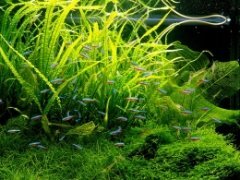 You may or may not have heard of HR 669, also known as the Nonnative Wildlife Invasion Prevention Act, but it will significantly affect the aquascaping hobby if it becomes law. Ultimately, it prevents importation, trade, and transportation of a selection of nonnative species in the US. Not all nonnative species will be outlawed, but any deemed dangerous to local ecosystems. There has been a lot of wild and crazy stuff reported about HR 669 (no your nonnative species of dog will not be destroyed) but if it does become law, it will seriously impact the species of plants, fish, and shrimp available to the hobby today. For hobbyists, it means a drastically reduced selection. We would be limited to plants not banned, which will mainly be native plants (like Didiplis diandra). We would be able to keep the plants we have but would have to be able to prove we had them before the law was enacted. We also wouldn't be able to trade or transport these species between states. That means no more buying or trading aquatic plants from fellow hobbyists. For fish and shrimp, the same rules would apply, except that breeding the animals (whether intentional or not) would also be illegal. Clearly, this legistlation would take a lot of the fun out of the hobby and severly impact the numbers of people who currently enjoy it. For those in the industry of supplying these plants and animals, and the products to care for them, this law will effectively put them out of business. Think of your local fish store and how many species would be considered nonnative. Probably over 90% if not all of them. Coupled with the hobbyists who will have lost interest in the hobby no longer purchasing pet supplies, the entire industry is in for a harsh and rapid reduction in size. This is why they've been lobbying so hard against HR 669. I understand the aim of HR 669 and I certainly support restrictions on nonnative wildlife to prevent damage to local ecosystems. However, a balance needs to be reached. Outlawing the posession of plants and animals that almost every hobbyist owns is not going to help the problem, and may even make it worse. What happens to all those illegal species when people discover that they are breaking the law? I can assure you that not all of them will be disposed of properly. You can find more information on the bill, including the full text, which I encourage you to read (it's not that dry, and has some very important information), a site against HR 669, and a list of things you can do to make your voice heard on HR 669. Today only you can also follow the Congressional hearing on HR 669 via a live blog. Says that Meyers and Williams led great grassroots networking to get people from all over the country to respond, says he commends them both for their networking system to make sure that those of us who introduce legislation hear input from public and American people to make sure legislation that's passed has their input. Asks Mr. Fraser: Is the whole focus of this bill on non-native invasive plants, marine and land animals? Fraser: Focus is to control important and interstate transport of non-native wildlife, animals and fish, NOT plants." Still, those of you crazy Americans who have the nerve to keep FISH in your aquariums will still be affected it seems. Up here in Canada, it looks like they haven't outlawed my hobbies just yet. Right, I saw that section too which says the focus is not plants...but then the first half of the hearing was devoted to kudzu, the invasive weed from the southeast US. So it wasn't exactly clear whether aquatic plants were a focus. I think That this bill is actually pretty important, maybe not to the degree, but invasive species tend to kill off native species and alter ecosystems for an extremely long time, and that is due to the negligence of the person that discards the plant or animal from their aquarium incorrectly. So please do not immediately kill the bill until you read up on a few invasive species issues, and then narrow it down. There have been entire species wiped out because of invasions like that. I don't think it is a right bill, but I do think something needs to be put in place to lessen the impact of invasive species.